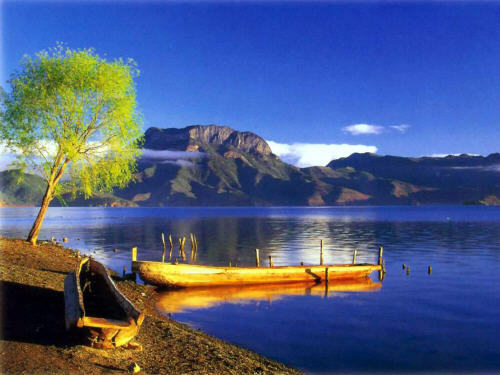 Lugu Lake (Lúgū Hú 泸沽湖) is located at the border of Sichuan and Yunnan Province. It is 202km north of Lijiang and is also under the control of both provinces. The lake is a high mountain plateau lake. 2685 meters above sea level and has an area of 48.5 square km. The deepest end of the lake is about 93.5 meters. The beauty of the lake with its surrounding breath-taking scenery makes this lake an excellent tourist resort. It is surrounded by high and sublime mountains. Since the lake is rather deep, a definite regulating influence is exerted on the temperature of the lakeshores. Therefore the surrounding mountains abound in forest resources that afford an exquisite beauty, much fresh air and charming scenery. At present it is one of the places in China that is least damaged by human activity and best preserved in its natural features. Dali Ancient City (Dà lǐ gǔ chéng 大理古城) is 13 kilometers (8.1 miles) away from Xiaguan (xià guān下关) in Dali City, Yunnan Province and is one of the 'Three Ancients' (Ancient Cities, Ancient Pagodas and Ancient Steles) of the Dali Scenic Spot. It can be dated back to the year 1382 during the Ming Dynasty (1368-1644) and has been among the top listed historical cities of China since 1982. With Erhai Lake to the east, and Cangshan Mountain to the west, its grand city wall, traditional Bai ethnic minority folk houses and marvelous scenery have been attracting many visitors. Have you ever heard about Mt. 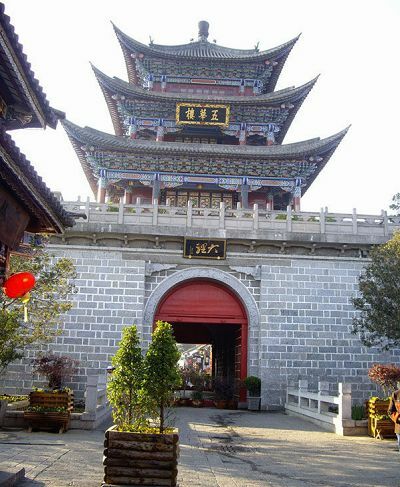 Cangshan (cāng shān 苍山) in Dali City (dà lǐ shì 大理市) in Yunnan Province (yún nán shěng 云南省)? Flower enthusiasts or 'green thumbs' may be familiar with this mountain because of the beautiful azalea flowers grown here. Locating between 10004'-10016'east longitude and 2703'-2740' north latitude, Jade Dragon Snow Mountain (Yùlóngxuě Shān 玉龙雪山) is the southernmost glacier in the Northern Hemisphere. 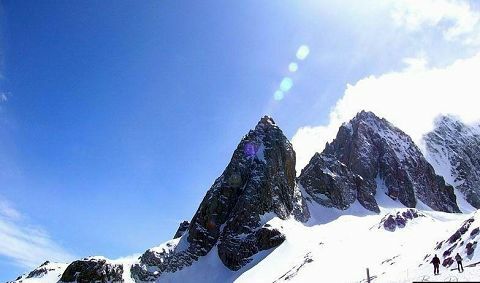 Consisting of 13 peaks, among which Shanzidou is the highest one with an altitude of 5,600 meters (18,360 feet), Jade Dragon Snow Mountain stretches a length of 35 kilometers (22 miles) and a width of 20 kilometers (13 miles). Looking from Lijiang Old Town in the south which is 15 kilometers (nine miles) away, the snow-covered and fog-enlaced mountain resembles a jade dragon lying in the clouds, hence, the name Jade Dragon Snow Mountain. 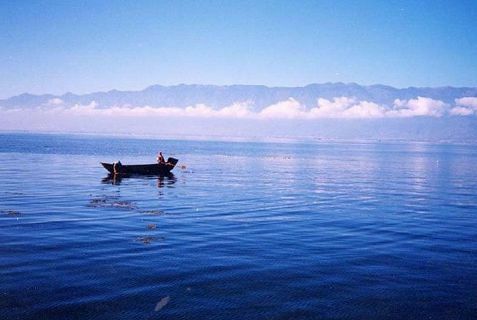 Erhai Lake (érhǎi 洱海) is the largest highland lake next to Dianchi and one of the seven biggest fresh water lakes in China. It means, 'sea shaped like an ear', in Chinese. Implying that the lake is ear shaped and as large as a sea, hence it was so named. The lake covers an area of 250 square kilometers and is located about two kilometers east of Dali. It is like a crescent lying between Cangshan and Dali city as seen from Cangshan Mount. 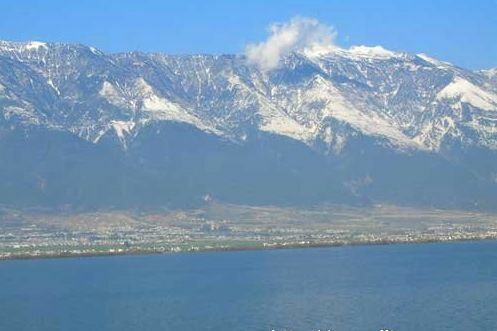 In a sunny day, the crystal waters of Erhai Lake and the snow mantled Cangshan Mount radiate with each other. Thus the scene was commonly described as 'Silver Cangshan and Jade Erhai'.